Out with the old, and in with the new… or so they say. How was your 2016? Are there things that you wish you would’ve done differently? The week between Christmas and New Years always seems to offer us the opportunity to narrow our focus regarding time and our use or misuse of it. We evaluate what worked and what didn’t. We close chapters and open new ones. We process or we produce. Regardless of what the past 365 days looked like in your life, they’re gone and the only reason to look back is to learn from those valuable lessons to help mold us to be more like Jesus in the days ahead. 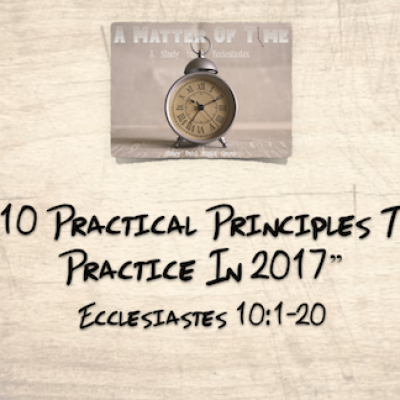 This week we will resume our #TimeMatters series by looking at “10 Practical Principles To Practice In 2017” from Ecclesiastes 10:1-20. Start your new year off right and join us on Sunday!